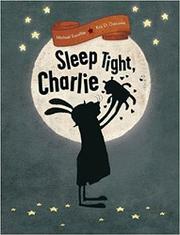 Charlie, a rabbit who loves an established bedtime routine, grows grouchy when noisy animal neighbors disrupt his sleep. Victorian clothes (Charlie even wears his bowler hat to bed! ), dreary colors (cardboard browns, cement grays, faded blues), and antique objects (an iron bed, a Victrola, keyed roller skates) describe the rabbit’s quirky, austere lifestyle—one perhaps unsuited for intrusion or surprise. Just when Charlie finishes preparing for bed, doing the things he always does, in order, (glass of water on his bedside table, slippers on the rug, monster check under the bed, teddy-bear hug, one eye closed, then the other) a thunderous “TAP TAP TAP TAP TAP TAP TAP TAP TAP” jolts him awake. It’s Bird hammering on trees (with a hammer)—then it’s Squirrel crunching nuts, then Mouse squeaking on the swings. Double-page spreads with only the enormous, block-letter, onomatopoeic words stretching their length make the volume and intensity of the interruptions clear. Soon Charlie’s routine is hopelessly jumbled. Charlie’s eyes grow smudgy and ringed with dark circles. His rage mounts. Children involved with their own bedtime rituals will enjoy following the incremental dismantling of Charlie’s. Voicing Charlie’s confrontations with his neighbors and amping up the animals’ annoying sounds make for a delightful ruckus and funny read-aloud.